Sometimes we need a little inspiration when it comes to adding more vegetables to our plate. 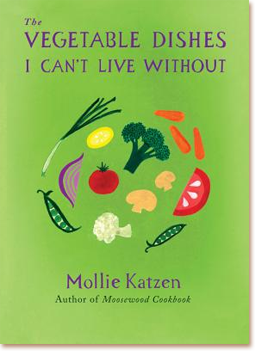 Thankfully for us, Mollie Katzen knows a thing or two about vegetables. On the 30th anniversary of her groundbreaking Moosewood Cookbook, Mollie presents 100 delicious vegetable dishes in this delightful and beautiful cookbook. Whether you need an appetizer, a quick and easy snack for the kids, or something to accompany a main dish, this cookbook offers creative recipes and countless ways to infuse more vegetables into our diets. Both vegetarians and meat-eaters alike can benefit from these tasty and healthy side dishes, many of which you can even serve as stand-alone meals. Presented in her signature style and with her classic pen-and-ink illustrations The Vegetable Dishes I Cant Live Without is an assortment of recipes Mollie’s millions of fans will appreciate. "Mollie's well-loved personal favorites offer a sound place for new vegetable cooks to begin enjoying the myriad delights that produce promises. And she's right—the willingness to focus on even a few details is the key to making food that will sparkle, shine, and delight those who partake."